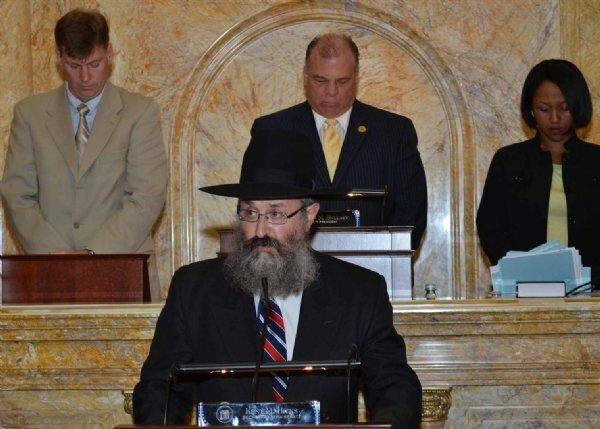 Chabad Rabbi Opens New Jersey Senate with Prayer The New Jersey Senate invited Rabbi Yosef Carlebach, founder and director of Chabad House at Rutgers University to open the session as guest chaplain. 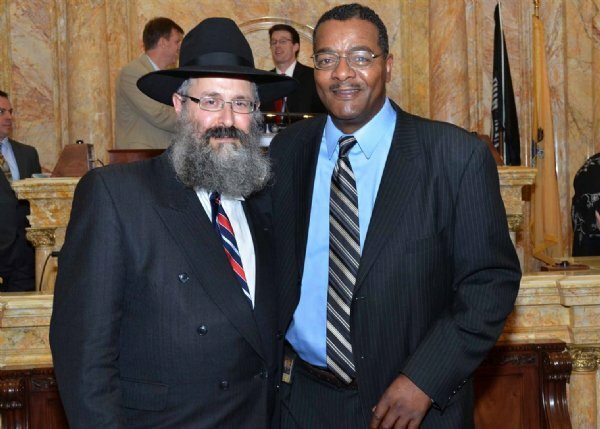 The rabbi was invited by Senator Jennifer Beck and Secretary Hicks of the NJ Senate. Before the opening prayer, Rabbi Carlebach was introduced and met privately with ten senators, including Senator Beck, Senator Singer, Senator Kean, Senator Kyrillos, Senator Thompson, and Secretary Hicks. "Esteemed Members of the Senate. I am Rabbi Yosef Carlebach, spiritual leader of Chabad House, the Jewish Student Center at Rutgers University. This center was founded by the Lubavitcher Rebbe, Rabbi Menachem Mendel Schneerson, in 1978, and operates today as the largest Jewish center on any public university, a place that is needed more than ever by our young men and women on campus. I am honored and humbled to be standing in this Senate Chamber. We, the People of the Book, believe in Divine Providence, and we gratefully acknowledge that it is G-d's direct will that we as a state and country are blessed with true leadership in these challenging times. We thank G-d today, that our State is blessed with men and women of unwavering strength, belief, and conviction. We also know that this immutable power is borne out of profound faith, hope, prayer, and trust in G-d Almighty. Before issuing your Commandments, the most crucial of which are: Thou shalt not commit murder; Thou shalt not commit adultery; Thou shalt not steal, You awesomely declared, 'I am G-d, your G-d'. You declared so because, in Your infinite wisdom, You knew that only by constantly focusing on Your sovereignty could humans control their negative impulses. 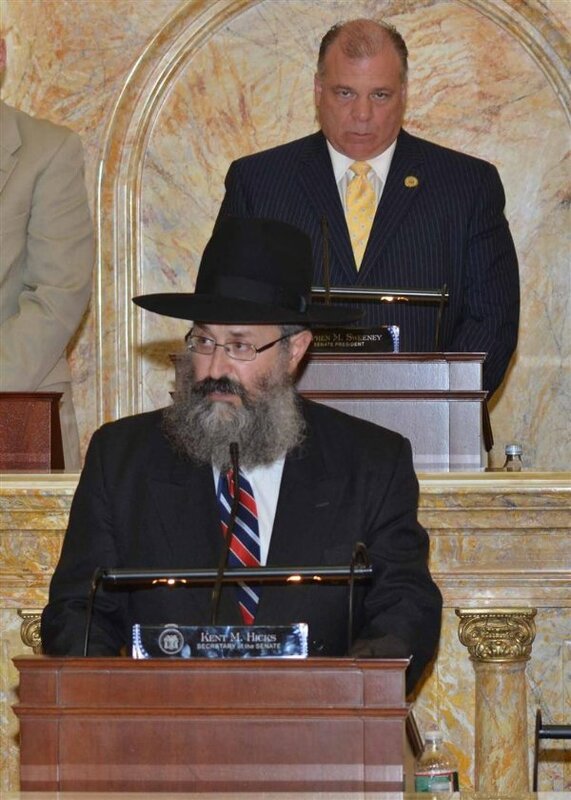 Almighty G-d, this august institution, the New Jersey Senate, responds daily to Your declaration at Sinai by opening their convocations in this historic and noble Chamber with the recognition of Your sovereign presence and by publicly offering prayers to You. Reward this sacred practice by granting the Senators good health, good cheer, good fellowship, long life, and abundant wisdom. May this wise and sacred practice be an inspiration to all convocations and assemblies which are convened daily throughout our blessed state and country, and throughout the world to do likewise, so that morality, safety, tranquility, and happiness prevail throughout our country and throughout the world.